Nothing beats the superior beauty and elegance of custom made curtains. 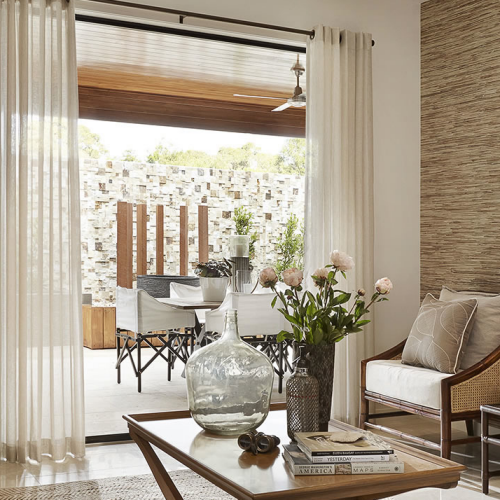 They can transform a drab window into a showpiece and encourage, filter and diffuse natural light – highlighting a room’s best features and downplaying its worst. Unfortunately, windows don’t come in uniform sizes, so finding the perfect curtains which match your decor, style, taste as well as fit your windows can be a little daunting. Understanding the common issues around selecting the right curtain fabrics and customising them to complement and enhance your home, is the first step to picture perfect windows. Common mistake: Curtains can make or break the look of a room. Curtains which are too short can appear as if you have scrimped on the fabric or used secondhand curtains designed for a smaller window. A puddle of material due to curtains being too long, can be almost as bad. Solution: Even if you are getting custom made curtains, you may need to provide accurate measurements to ensure precision fitting. Your curtain provider can give you tips on how to measure your windows for optimal fit but if not, the following instructions may be of some assistance. Firstly fit all curtain rods and tracks around 10 – 20 cm (depending on personal preference) above all the window recesses you intend to cover. This will give a uniformity to all the gaps between the rods and the ceiling. Next, decide whether the curtain drop will be to the window sill or the floor. Curtains which drop to the sill usually finish 1.25cm above the sill. Curtains which drop just below the sill will ideally sit around 15 cm below but this is a matter of taste and personal preference. Curtains which drop to the floor should allow a 2.5cm clearance to avoid dragging. Rod and ring curtains should be measured from the bottom of the ring. To this raw measurement add another 20 cms (5 cms for the top seam allowance and 15 cms for the bottom hem) for lined and unlined curtains with tab or tape tops. Curtains which have cased headings will require 25 cms added to the finished length (10 cms for the top seam allowance and 15 cms for the bottom hem). Common mistake: A shortage of fabric in the width of your curtains can make even the most luxuriant fabric look stingy and cheap. Solution: Again, accurate measurements with enough fabric allowance to allow curtains to crossover in the middle to ensure privacy. They should also have ample fabric to look ‘drapey’ and flowing. Aim for the width of the fabric to be two to two and a half times as wide as the window. Common mistake: Selecting mismatched curtains or window treatments throughout a home can be jarring, causing the decor to look hobbled together. Solution: To create a seamless flow and theme through your home, match curtains, blinds and other window treatments. They needn’t be all the same – curtains in a kitchen will not be the same as those in a formal dining room for instance, but they should complement each other. Common mistake: The use of poor-quality fabrics or those which are unsuitable for their use, can bring a room down quicker than any other feature. Solution: The fall of a curtain can tell a great deal about the quality of the fabric and workmanship involved in its production. Curtains and window treatments are a substantial investment and as such should be selected thoughtfully with consideration given to each room and use. Begin by moving from room to room, identifying the amount of light which enters and the desired level of sun blocking and privacy required. Working within your colour pallette so as to maintain uniformity, use hues and tones to create warmth in living areas, brighten dull, dark rooms or block light to specialty rooms such as baby’s room or home cinema. Common mistake: Garish mismatches of colour can prevent a feeling of flow and uniformity. They can also date quickly. Solution: Obtain some fabric swatches and hold them up in each room to see how they react with light changes over the course of a day. Sticking with neutral tones as much as possible is the safest way to avoid the curtains overwhelming your decor. Common mistake: If opting for rod and pocket style curtains, making the rod pocket too tight can prevent easy movement of the curtains and making them too loose can prevent them staying gathered when open. Solution: Pre-shrink all your curtaining fabric, to avoid any nasty surprises down the track. Use your rod as a guide and pin and tack the curtains in place. Check movement for sticking or gaping before sewing. Beautifully made curtains should be a focal point to any room of the home. Investing time into perfecting the cut, colour, conformity and quality, will pay dividends for many years to come.